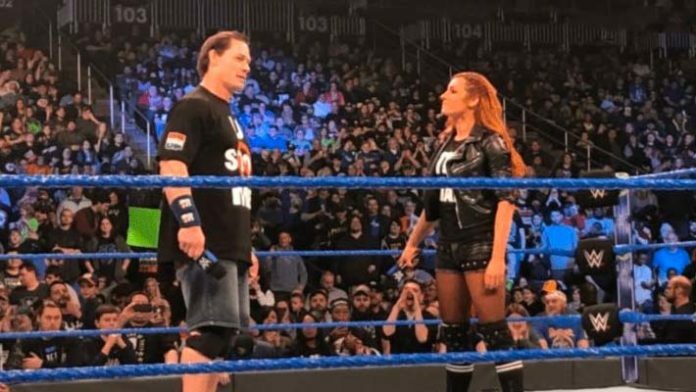 During the taping of New Years Day SmackDown Live last night in Pittsburgh, Pennsylvania, ‘The Man’ Becky Lynch came face-to-face with John Cena and confronted him. John Cena made his return after a long time away from WWE TV to the SmackDown audience and was unfortunately interrupted by for SmackDown Women’s Champion Becky Lynch. She told Cena that she will take his face off of the posters just like she took off Charlotte Flair’s face. She also added that if Cena has a problem with this then Nikki Bella will not be the only woman dropping him this year. They were then interrupted by the duo of Andrade “Cien” Almas and Zelina Vega as both came down to the ring and a mixed tag team match was officiated. The match ended with Becky throwing Cena out of the ring before making Zelina Vega submit. Even after all that BMJ offered a handshake to Becky but she declined and mocked him by doing the “You Can’t See Me” taunt, before walking away. The episode is set to air on 1 January. You can check out the spoilers by clicking here.